If you've been following Icethetics on Twitter, then you know I'm tracking the league-wide web site makeovers. Teams are adopting a new template that's closer to NHL.com. This is good news because that old template really needed to go. Today, the Buffalo Sabres became the latest team to make the transition and I can't stop looking at it. 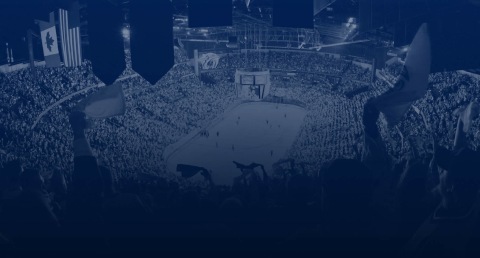 I've got a screenshot, but I highly recommend you take a trip to sabres.nhl.com on your own to fully experience it. It's just a phenomenal look, something we're not used to seeing on NHL team sites, generally speaking. The way the vintage logo is so prominently placed in the banner certainly indicates a shift in the way this team is being marketed — to actual fans! But mostly, it's the gold sabers running up and down the page. Is there anything more attention-grabbing? I'm way impressed. 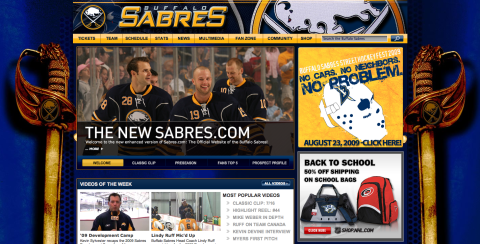 To be fair to the other teams, the Sabres aren't the only ones who got this redesign right. Seven others have already made the switch and none has disappointed. The Avalanche and Coyotes were the first. Both, solid. The Oilers, Thrashers and Blues followed. I think one of the elements making these sites more visually appealing is the attention to detail in the background images. It goes a long way. All three of these teams, along with the Avs, rotate multiple background images, primarily featuring different players. The Panthers too, and along with the Predators are two of the most recent members of the makeover club. The Preds make use of a really cool sweeping view of the inside of the Sommet Center on game night. I mean that's just cool. There are also a handful of teams who are currently in the process of making the change and I can offer you previews, courtesy of Tim. The Flames, Flyers, Stars, Kings and Bruins have redesigns in the pipeline. For the Bruins, not a big change, although Zdeno Chara does figure in prominently. The Flyers are loading down on the orange. And the Kings still prefer black to purple. The Flames and Stars seem to be most worthy of an advanced preview. Calgary has taken to lighting their players on fire for the sake of the internet. Even the players' equipment hasn't escaped the blaze. However, I really like the background depicting the roof the Saddledome. You get a good look at all those banners hanging from the rafters. The Stars will offer a sneak peek into the locker room with their background image. The thing that struck me was the ad, a version of which can be seen on their current web site. It looks to me like they've colorized the jerseys to make them green. And they look spectacular. But here's an idea: Why not actually wear green home jerseys?! No idea when these teams will make their official switches, but I'll keep an eye on it. In fact, I think this is definitely something to watch throughout the summer as each team makes its transition to the new NHL web format. Might even be the subject of a tournament at some point in the future. Who has the best web site? We'll see. In the meantime, what do you guys think of the new site templates being employed across the league? Like 'em? Hate 'em? Indifferent? Comment. Got a couple of things to add tonight. 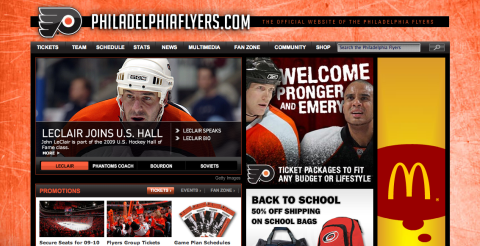 As mentioned, the Flyers launched their brand new site today and were the first team to go with a three-column format. It means the rotator on the left side of the page has been shrunk greatly, reducing the aesthetic the other sites share with NHL.com. A little disappointing but still better than it was two days ago. I've also got a little treat — a sneak peek at the Canucks' new web site. As I've been saying it's the background images that are really making these sites something to see, and Vancouver does not dismay. Have a look. The only unfortunate thing is that most of the logo isn't visible because the banner itself is such a small area. 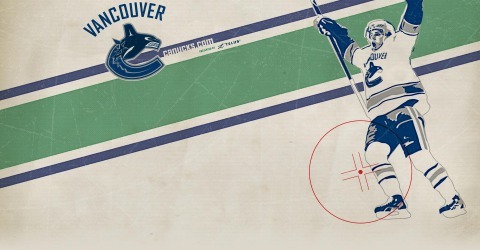 Still, a great image that will really give the Canucks a unique look online. I don't know exactly when it's supposed to go live, but I would expect it within the next week. Thoughts on either of these subjects?